What is Ayurveda Thai Yoga Massage? Ayurveda Medicine comes from India and is considered the world’s oldest healing system. It provides essential information about our individual nature and through increasing awareness of ourselves, we can become more empowered to live a life which is happy, healthy and balanced. How does it work and what will I feel like after an Ayurveda Thai Yoga Massage? We are all made up of a combination of 5 basic Elements:- Space, Air, Fire, Water and Earth. According to Ayurveda, the Elements combine together to work as 3 forces in our body. We all have these 3 forces in our body, but in varying quantities. Our rhythm, likes, dislikes and tendencies are all influenced by those forces. Ayurveda shows you your personal combination of these 3 forces (also called Doshas) and offers guidance on everything, from what style of massage to receive:- foods to eat and even lifestyle practices, which will help to regulate an optimal balance of the 3 Doshas, in your body. Then general maintenance becomes the path to living a healthy life. During an Ayurveda Thai Yoga Masseur, you will be asked a set of questions that will establish, which of the 3 Doshas is least dominant and needs bringing into balance. Then the Ayurveda Masseur will prescribes a set of advanced stretches and Asanas – Yoga Postures, relevant to rebalance the 3 Doshas. Hagbard – working the side of the body, followed with a spinal twist. What are the benefits of Ayurveda Thai Yoga Massage and what can it treat? 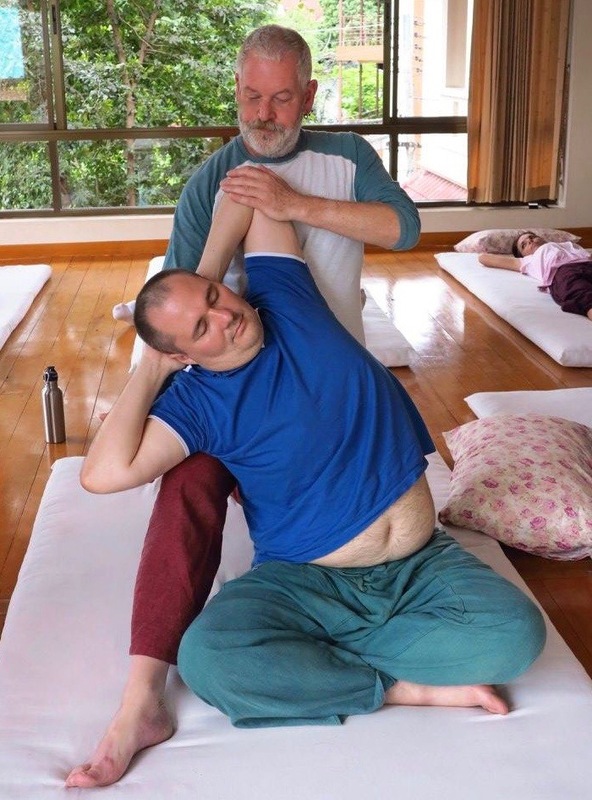 The benefits of Ayurveda Thai Yoga Massage are, it’s ability to treat and rebalance the 3 Doshas:- Vata (Air & Space) – Pitta (Fire & Water) – Kapha (Water & Earth). It’s also a therapeutic form of Thai Yoga Massage that allows emotional releases to occur, as and when appropriate. It works in a different way to Therapeutic Thai Massage as it not only release blocked energy, but blocked emotions as well. After receiving an Ayurveda Thai Yoga Massage, you will feel a lot more grounded, balanced, present, centred and energised, with increased flexibility and decreased stiffness. These effects usually last several weeks. It is advisable to shower, remove all makeup, perfume, aftershave, before coming for an Ayurveda Thai Yoga Massage treatment. It is your duty to inform me about any of the following: any medical conditions, use of medication, skin allergies/reactions, if you have high blood pressure, have a pacemaker, wear contact lenses, you are menstruating, you are pregnant or think you might be.